I used to marvel at people who’d go swimming in the Bay in the middle of the winter. Swimming in frigid murky water with nothing but a swimsuit. I used to think they were crazy, now people think I’m crazy. In 2008 I bought a cheap run-down 'Santana 22' sailboat. Since then I've spent countless hours working on it, including a major haulout in 2009. You don't need a big yacht to go cruising. I think we had more fun with my small catamaran that could be driven up onto a beach. What would you do with $3000 and three days to live your dream? This was the challenge posed to me by the Discovery Channel for a show called No Opportunity Wasted in 2005. 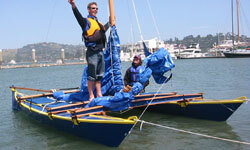 Many years ago I built a 17' catamaran from plans by James Wharram - It took about four months, and $3000 in materials. This is a rather dated story of my bike ride in 1999 from Bankok in Thailand to Kathmandu in Nepal. 5000kms over four months through Laos, China, and Tibet. It's a little dated now, but such a good adventure I wanted to keep it here.